we were rewarded with 13.1 miles of running in nearly perfect racing conditions. The Houston Rhythm and Blues Half Marathon provided this much needed respite from our extra intense Maine winter. Mike and I chose this race for our Texas race because it gave us a wonderful opportunity to visit with great friends, Bill and Terry (who also happen to be Amelia’s in-laws), another dear friend, Rebecca, and my cousin, Janet, and her husband, John. As an added bonus, Amelia signed up to run the race, too. When Mike and I have traveled to new states to do races, we have often traveled by ourselves. Having family and friends to visit on this trip truly made it much more enjoyable. and immediately understood why they say “everything is bigger in Texas”. Stepping out of the airport into the sunny 70 degree weather started the thawing process. We traveled to Bill and Terry’s lovely home and eagerly ventured out for a walk, daringly leaving our boots and coats behind! One of the aspects of traveling that we love is having the opportunity to see regional architecture, landscaping, and sights. Finding palm trees lining the spiffy retail area virtually around the corner from their quiet neighborhood was really unexpected. Bill and Terry took us to Central Market which is a short stroll from their home. We enviously surveyed the vast array of fresh produce, meat, fish, bread, cheese, wine, beer, and so much more that the market offers. We bought a local beer and some Texas grapefruit to bring home to Hannah. Dinner was at the renowned Goode Company where we enjoyed some authentic Texas BBQ. This photo isn’t too great but the food certainly was! The next evening we were enjoying a glass of wine in the living room when four tuxedo-clad men walked into the house and announced that they were there to serenade Amelia with love songs! Her husband, Matt, had arranged this special Valentine’s Day gift. It was a charming experience to listen to this a capella quartet sing beautiful songs just feet from us. Afterward we were treated to some of Bill’s exquisite cooking as we savored a delectable Mexican dinner. Our race was the next day. Amelia, Mike, and I couldn’t stop commenting on how novel it was to be outside dressed in only shorts and a shirt. The weather was perfect for our half marathon. Cloudy skies and low 60 temps were just what we had dreamed of as we had pounded the pavement slogged along on snowy roads in Maine while training for this event. The half marathon course was a double loop which was mostly flat. The only hills occurred when the road dipped under overpasses. There were several bands along the route which made for a festive run. We loved being able to see Amelia three times when she ran past us on the other side of the course. She looked awesome each time we saw her which was especially terrific since it was her first race after coming back from a serious injury after running a marathon. Bill and Terry had biked to the course and cheered us on each time we ran past. This was such an added treat since we are almost always running in areas where we don’t know anyone. They even took pictures! It looks like I’m praying but I was actually just clapping. Here Mike has apparently abandoned me and has taken up with some other women! One of the perks of this race is that you can download all of the professional photos for free. This is one they took of Mike. Amelia finished first and took some photos of us as we neared the finish line. and headed to the food and beer tents with out little “good for one beer” ticket that had came with our race bib. BUT they were out of beer! How could that happen?? It seemed that everyone would be guaranteed their token (literally) beer with the ticket system. Alas, this was not to be. and the especially terrific treat of having Amelia with us. Later that day we were greeted with more Texas hospitality when we arrived at Janet and John’s beautiful home on the outskirts of Houston. They more than made up for the missing race beer by providing us with a vast array of new beers to sample. Dinner was an “epicurean triumph” to use our grandfather’s famous phrase. Once again, having a chance to visit with family added a wonderful new dimension to our racing quest. A visit to the St. Arnold Brewery the next day continued to compensate us for our missed race beer. We signed up for the tour which includes tokens to sample four of their numerous beers. Although all of their beers were fantastic, Janet and I enjoyed their Weedwacker brew, Amelia loved the seasonal Spring Bock, and Mike and John seemed to be especially fond of Ale Wagger Brown. St. Arnold Brewery donates a portion of their proceeds from Ale Wagger sales to local animal rescue organizations. We flew home on Fat Tuesday which was highlighted by our gate attendant’s attire. Our flight was delayed several hours due to weather-related issues but we were generously compensated with vouchers for use on a future flight. This was a perfect way to end the trip to our nineteenth quest state as we look forward to our next adventure. Where should we run next? The Bottom Line: It was worth training in tough conditions for the reward of running in a warm climate. But the truly best part of running in Texas was having a chance to visit with family and friends! It has been a wonderful week of preparation, festivities, relaxation, and runs. Here are a few tidbits of what’s been happening. This little guy came right up to the fence as we went by on our long run on Sunday. During the week, Bentley was uncharacteristically excited about me doing Pilates. Having an enormous, slobbery, furry friend excitedly hover above you as you try to do leg lifts is actually quite alarming. Eventually he just plunked down on my mat which was also less than helpful. Abby, on the other hand, is happiest when she’s sitting by a blazing fire. We call her our little “heat seeker” and figure she loves the warmth because she was a rescue from Tennessee. Mike and I went out to do a little shopping last weekend and stopped for a delicious lunch at When Pigs Fly. This special was listed as “soup” (their quotation marks). 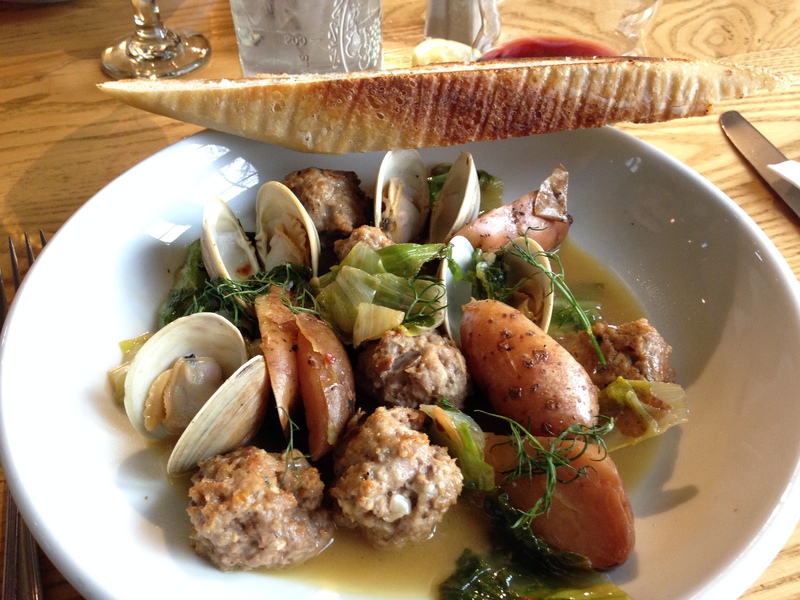 It had clams, sausage, fennel, Meyer lemons, broth, and fingerling potatoes. It was divine! Their extensive beer list is one of the reasons we love to go there. I did an early Christmas Eve morning interval run. The weather was drizzly but the temperature was relatively mild. Amelia’s Spotify Christmas playlist was the perfect soundtrack for this holiday run. I couldn’t resist snapping a couple of photos. It’s been unseasonably warm here in Maine so the snow is dwindling and the ice has melted. I thought this wreath on the wrought iron fence surrounding a historic town cemetery was picturesque and festive. I returned home feeling strong and pleased with the run. I have realized that I am a big fan of presents when they are still wrapped. Christmas Eve was very quiet-just Mike, Hannah, and I. But we made the best of it and enjoyed trying out a new-to-us cocktail, a Moscow Mule. I liked the drink but I really loved the traditional copper mugs that they are served in. Christmas day was quiet and relaxed. We missed having Amelia and Matt here but we are working on adjusting to the new “normal”. Having our long-time friends join us for dinner was perfect. I was slightly alarmed to realize that my shoes matched the tablecloth! But, I do LOVE plaid! The day after Christmas Mike and I headed out for our weekly long run. We are in week two of our half marathon training for the Houston Rhythm and Blues Half Marathon which is on February 15th. We did eight really hilly miles and felt terrific about our efforts. This morning the sunrise was spectacular. I couldn’t stop taking pictures. I walked up into our top field to get a new perspective. On my way back to the house, Hannah’s pony, Chelsea, called to me as she looked out of her window. She may have been a little miffed that I had put photographing a fleeting sunrise ahead of her breakfast. Poor Chels! We hope your week was warm and festive. What was the best part of your holiday week?